I am going from Albuquerque to Cedar City on the 7th of April. I tentatively have it planned to stop in Farmington for one night and Kanab in one night. The ABQ to Farmington route is mostly on US 550. I will be spending a few weeks in Cedar City and would like to go to Moab for Canyonlands and possibly Arches, but I'm worried about the higher elevation of Interstate 70 and potential snow. I don't see another practical way to get from Cedar City to Moab. I have a Honda Civic and zero winter driving experience. Do I have any major weather concerns or steep heights with sharp turns on any of the above mentioned routes? With Cedar City > Moab, I can probably decide at the last minute, but might risk getting stuck in Moab for longer than intended. Coming from Southern California to Albuquerque I basically took I-40 the whole way, so it was a breeze.... I could get from ABQ to Cedar City on I-40 and I-15 but I think that would be a more boring drive. Weather issues are incredibly unlikely on the Colorado Plateau in April. Do UT 12 to get Bryce Canyon and Capitol Reef if you have heading to Moab. UT 12 and 24 are beautiful state highways that won't have much traffic on them outside tourist season. I-70 through the Swell is nice but don't double back if you don't have to. I would suggest Goblin Valley, Cedar Breaks, and Natural Bridges National Monument...maybe even the Moki Dugway if you have time. Thompson Springs and Cisco are ghost towns off of I-70 near Moab if you want some good old alignments of US 6/50. Also take US 89a, way more scenic with the Vermillion Cliffs and north Rim of the Grand Canyon than mainline US 89. Do UT 12 to get Bryce Canyon and Capitol Reef if you have heading to Moab. UT 12 and 24 are beautiful state highways that won't have much traffic on them outside tourist season. I wholeheartedly agree. Having driven those routes from east to west back in the 90s (having come up from Glen Canyon), I would gladly return for the scenery. Here is an example route that includes those routes, the ghost towns mentioned, and two Moab-area parks. We visited part of that area in September 2015 on a trip to Albuquerque and Phoenix. Went to the Grand Canyon in between and took the scenic route via Four Corners and Monument Valley. I highly recommend swinging north into southeast Utah after you leave Farmington. Our route took us west on US-64 to Teec Nos Pos just over the Arizona line, then a right turn onto US-160 up to Four Corners. Four Corners itself is a bit of a rip-off in terms of the price, although I'm glad we paid it just because it's something unique to see. If you are by yourself it would be less interesting unless you're comfortable giving your camera to a stranger because the whole point of going there is to get a picture of yourself standing in four states at once. Using a tripod and a remote might be tricky just because there are enough people around that some of them might not wait for you, although that would be a much better option than those stupid cell-phone stick things. From Four Corners we made a left and crossed into Colorado, then made another left onto CO-41, which then becomes UT-162 after crossing the state line. It ends at Bluff, where we made a left onto US-191 to head southwest to the Valley of the Gods (it becomes US-163 southwest of Bluff). This is a very scenic road, well worth driving. We stopped for the night at the Valley of the Gods Bed and Breakfast, which is located near the bottom of the Moki Dugway. Beautiful place, utterly unexpected find in such a remote area (I contacted them months in advance....if you're going in a few weeks, they may not have anything because it is a small place). We drove the half hour back to Bluff for dinner and then came back to the B&B. The night sky was UTTERLY MAGNIFICENT there, really makes you see what we miss out on when we live in urban or suburban areas with all the light pollution. The following morning after we checked out, we went up the Moki Dugway and drove down the dirt road to Muley Point. Great photo spot. We then drove back down the Dugway and back to US-163 and made a right towards Mexican Hat. The road then takes you through Monument Valley. The one thing we didn't get to do was to drive the 17-mile dirt road through the Valley of the Gods. We just didn't have time: the 17-mile drive takes an hour and on the day we arrived, darkness was coming too soon to allow for it, and on the next day we wanted to haul the four or five hours to the Grand Canyon well prior to sunset (bearing in mind most of Arizona does not observe DST, too). It is the scenery along this route that makes it worth the longer drive, even if you don't stop for the night anywhere. 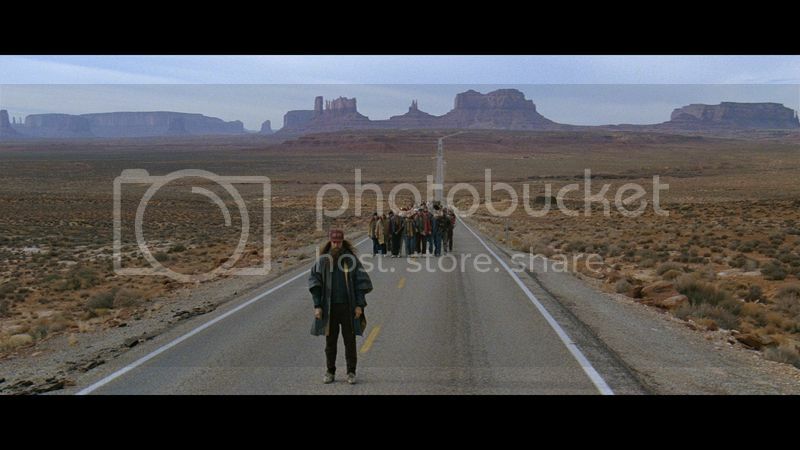 I assume you've seen photos of Monument Valley or else you've seen it in movies (to name but two, Forrest Gump ended his cross-country run near milepost 13 in Utah on US-163 and there is a sign off to one side of the road; also the cavalry scene in Back to the Future III was filmed there). Seeing it for real is that much more incredible. After Monument Valley, US-163 runs down to Kayenta and puts you back onto US-160 over to AZ-98 as you've described. I haven't measured out the comparative distances, but I assume I've given you enough detail to allow you to do so if you want. I can post some pictures from US-163 and maybe UT-162 if you'd like, especially if I wind up having tomorrow off work. Let me know. Thanks for the tips, all! I can post some pictures from US-163 and maybe UT-162 if you'd like, especially if I wind up having tomorrow off work. Let me know. Moab itself gets 7 inches of snow per year. Take highway 12 if practical, and don't miss Zion & Bryce Canyons!! Turns out we didn't get enough snow for the office to close, just to open late, so I'll post some of what I already have online and I may upload some others if we wind up staying home (the street out front is pretty darn slick). I will try to add some Monument Valley later. Got to go shave and start getting ready for work. Edited: Ms1995hoo is being a pain about getting up for work (her office opens an hour later than mine today, so she refuses to care about whether I get there on time), so I made another cup of coffee. 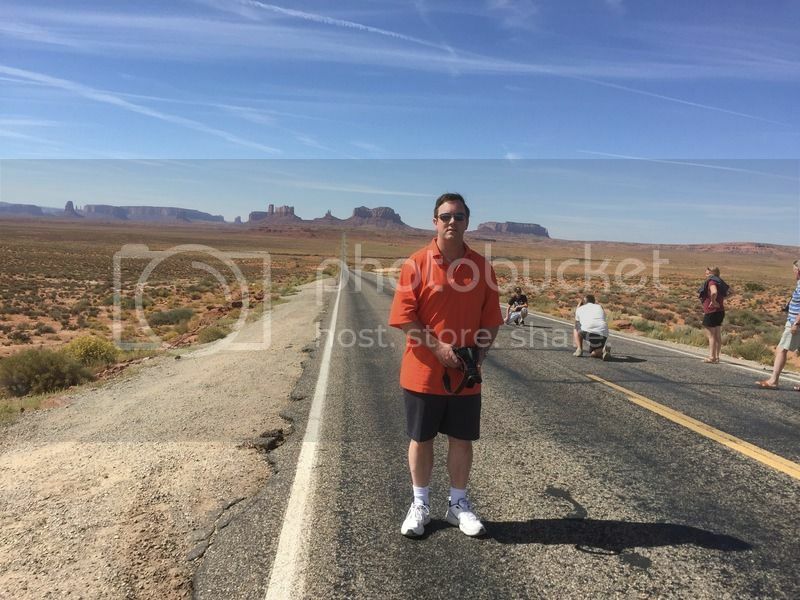 Here's one of Monument Valley, unfortunately taken at the wrong angle compared to how Forrest Gump was shown. In both pictures, we are standing on US-163 (this annoyed my wife, as she felt it wasn't safe to stand in the road on a highway with a 65-mph speed limit). By the US 191/I-70 interchange is a rest area offering a tremendous panoramic view of a gorgeous landscape. Having brought along a cooler with some food to warm up and a microwave oven that got power from the restroom, a friend and I enjoyed a fine little feast and took in the wonders of nature to make for a most memorable meal back in April 1995. Hope you wind up with as many smiles on your trip as I got out of this one 22 years ago! Thanks for this route idea. Is there plenty of gas stations on this sort of route? I have a Civic which does not have a huge tank, though I guess it does get good mileage. East of Hanksville, the pickings are slim -- the only gas stops/towns are just off I-70 in Green River (some), Crescent Junction (one or two) , Thompson Springs (one) and then many once in Moab. or two) , Thompson Springs (one) and then many once in Moab. Basically I always fill up at the Sinclair on UT 63 at the entrance to Bryce Canyon National Park. That will only be a half tank in a Civic since it is only about 220 miles between Bryce Canyon and Green River. Pretty much every gas station in between is kind of a name brand, just make sure you don't fill up with crappy 85 octane. I was confused by the 86 octane near Gallup, NM, I had never seen below 87 octane in California. I've noticed a lot of the gas stations here in ABQ (even Shell or Chevron) just have "unleaded" and "diesel". Hopefully it's not 85. Mid-Grade is usually 88 octane in Utah. I've had issues in both Utah and New Mexico making my engine knock over the years and flagging something in the emissions. But then again I have a car with a small turbo (rated for 87) which probably doesn't help my cause despite the elevation. General rule of thumb, according to our relatives in Arizona, is that once you're out of the cities and off the Interstate, you should go ahead and fill up if you're at half a tank in case you head through an area with a long gap between gas stations. That is accurate. There are only two stretches along the routing I suggested where you go more than 50 miles without gas, and both of them are east of Hanksville. There is no gas between Moab and Arches NP, but there is a station on the way to Dead Horse Point SP, at the junction of US 191 & UT 313. Don't go below half a tank out west! Actually, even if you plan ahead for the chance of one of the stations above being closed, you're still left with only one driving stretch of longer than 70 miles. Needing gas any more frequently than that would require (1) the gas station in two towns in a row being closed, (2) all gas stations being closed in a town with multiple stations, or (3) a really, really small gas tank. I'd say there is much more to worry about with no gas out in Nevada or the Californian Mojave then Utah. I know of a 160 mile stretch on US 6 with no gas, two 90 mile plus segments on US 95, and even a good 100 mile lapse on CA 62. Utah has a lot of small Mormon settlements with 200-500 people out in the middle of nowhere that usually has gas or other off-brand services. Arizona is much of the same sans something like US 191 south of Greer.